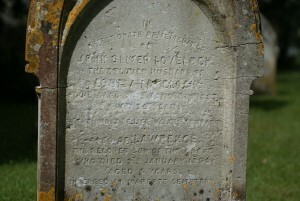 Headstone reads "In affectionate remembrance of John Oliver LOVELOCK the beloved husband of Louisa LOVELOCK died 24 Jan 1887 aged 39. Lawrence LOVELOCK the beloved son of above died 3 Jan 1899 aged 4. Interred in Margate Cemetery"